Kohl’s Corporation, a Fortune 500 company headquartered in suburban Menomonee Falls, operates a national chain of over 1,100 department stores. The Corporation had over $19 billion in sales in 2014. As of 2015, Kohl’s had stores in every state except Hawaii and employed a total of 137,500 people across its corporate and retail locations. Forty of Kohl’s stores as well as 10,500 employees were located within Wisconsin. Although Kohl’s gained national recognition as a department store chain, the corporation has its origins in the grocery business. In the 1920s, Max Kohl, a Polish Jewish immigrant to Milwaukee, opened a traditional grocery store at Lincoln Avenue and Kinnickinnic Avenue in the Bay View neighborhood. Nearly two decades later in 1946, he opened his first supermarket in Milwaukee’s Sherman Park neighborhood. 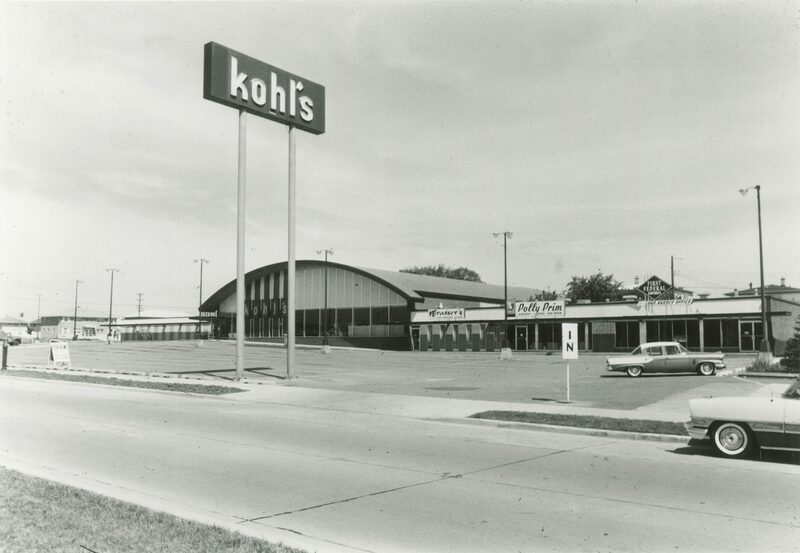 Hoping to draw additional shoppers to his stores, Kohl opened his first department store in conjunction with a supermarket in 1962. Kohl and his sons continued to expand their company beyond groceries. In 1967, the Kohls embarked on creating shopping malls, Granville’s Northridge and Greendale’s Southridge. By 1972, the Kohl family’s retail enterprise included fifty-six supermarkets, six department stores, three drug stores, and three liquor stores. That same year, the Kohls sold a controlling interest in their stores to a subsidiary of the British American Tobacco Company. By the end of the decade, Max’s son Herb Kohl, a future owner of the Milwaukee Bucks and U.S. Senator, had resigned as president of Kohl’s. Herb Kohl was the last member of the family to lead the company. In the 1980s and 1990s, following another change in leadership, Kohl’s began its national expansion. After selling off the Kohl’s Food Stores in 1983, British American Tobacco decided to part with the Kohl’s Department Stores three years later. A group of management executives and investors, led by William Kellogg, bought the 40-store retail chain. The company determinedly expanded, beginning with its acquisition of Federated’s Main Street stores in 1988. With this purchase, Kohl’s entered the Chicago, Detroit, and Minneapolis-St. Paul markets. The company’s continued growth prompted the leadership to take Kohl’s public with an initial public offering in 1992. In 1998, Kohl’s joined the S&P 500. When the department store chain opened twenty-eight stores in California in 2003, it had officially reached from coast to coast. Kohl’s success is tied to its operational position between department stores and discount retailers, but this model has not been without some controversy. 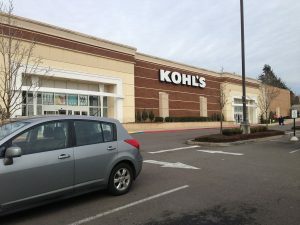 By carrying national brands with reduced overhead, Kohl’s is often able to offer lower prices than traditional department stores. The company is known for offering these prices by running sales on large segments of its merchandise. In addition to ongoing challenges from traditional big box competitors, in the twenty-first century Kohl’s must take on internet rivals. Still, Kohl’s continued success has clearly come from courting middle-income families. ^ Kohl’s Fact Book, Q3 2015, accessed March 22, 2016, 11, 24, https://www.kohlscorporation.com/PDFs/2015/Q3-2015-FactBook.pdf, now available at https://corporate.kohls.com/content/dam/kohlscorp/non-press-release-pdfs/2015/Q3-2015-FactBook1.pdf, last accessed August 23, 2017; “157. Kohl’s,” Fortune, accessed March 23, 2016. ^ Kohl’s Fact Book, 16. ^ Kohl’s Fact Book, 11. ^ Kurt F. Stone, The Jews of Capitol Hill: A Compendium of Jewish Congressional Members (Lanham, MD: Scarecrow, 2011), 470; Robert W. Wells, “Kohl’s Founder Expanded, Built a Fortune,” Milwaukee Journal, June 11, 1969, https://news.google.com/newspapers?id=3D0aAAAAIBAJ&sjid=JSgEAAAAIBAJ&pg=4567%2C564281, accessed March 23, 2016. ^ Tom Daykin, “1st Kohl’s Supermarket to Be Next Lena’s,” Milwaukee Journal Sentinel, June 14, 2002, https://news.google.com/newspapers?id=Cr4aAAAAIBAJ&sjid=9EEEAAAAIBAJ&pg=6678%2C2178805, accessed March 23, 2016. ^ Kohl’s Fact Book, 6; Roger A. Stafford, “Kohl Retailing Empire Eyes Midwest Sites,” Milwaukee Sentinel, August 2, 1972, https://news.google.com/newspapers?id=FcwVAAAAIBAJ&sjid=bhEEAAAAIBAJ&pg=7191%2C562362; Doris Hajewski, “Original Kohl’s Store in Brookfield Gets a Makeover,” Milwaukee Journal Sentinel, August 7, 2009, https://news.google.com/newspapers?id=Cr4aAAAAIBAJ&sjid=9EEEAAAAIBAJ&pg=6678%2C2178805, accessed March 23, 2016. ^ Robert W. Wells, “Kohl’s Founder Expanded, Built a Fortune,” Milwaukee Journal, June 11, 1969, https://news.google.com/newspapers?id=3D0aAAAAIBAJ&sjid=JSgEAAAAIBAJ&pg=4567%2C564281, accessed March 23, 2016. ^ “Kohl Family Sells Control of Markets,” Milwaukee Journal, October 27, 1972, https://news.google.com/newspapers?id=500aAAAAIBAJ&sjid=uCgEAAAAIBAJ&pg=6906%2C4594803, accessed March 23, 2016. ^ David Beal, “Kohl Family to Pull out of Retail Empire,” Milwaukee Journal, May 1, 1979, https://news.google.com/newspapers?id=CjAgAAAAIBAJ&sjid=LioEAAAAIBAJ&pg=6698%2C163774, accessed March 23, 2016; “Senator Kohl Keeps Low Profile,” McCook Daily Gazette, November 21, 2001, https://news.google.com/newspapers?id=nCcgAAAAIBAJ&sjid=WmsFAAAAIBAJ&pg=2927%2C3743378, accessed March 23, 2016. ^ Kohl’s Fact Book, 6. ^ Kohl’s Fact Book, 6; Doris Hajewski, “Kohl’s Chairman to Retire,” Milwaukee Journal Sentinel, September 13, 2000, https://news.google.com/newspapers?id=w7saAAAAIBAJ&sjid=jzgEAAAAIBAJ&pg=6018%2C2118558, accessed March 23, 2016. ^ Tina Daniell, “Kohl’s Makes a Big Buy,” Milwaukee Journal, October 28, 1988, https://news.google.com/newspapers?id=JWQaAAAAIBAJ&sjid=5yoEAAAAIBAJ&pg=6419%2C3700999, accessed March 23, 2016. ^ “California No Longer a Dream for Kohl’s,” Milwaukee Journal Sentinel, March 8, 2003, https://news.google.com/newspapers?id=96caAAAAIBAJ&sjid=fkMEAAAAIBAJ&pg=5513%2C5947618; Kohl’s Fact Book, 11, accessed March 23, 2016. ^ Anne D’Innocenzio, “Kohl’s Growth Threatens Rivals,” Rome News-Tribune, June 2, 2002, https://news.google.com/newspapers?id=-98vAAAAIBAJ&sjid=HTwDAAAAIBAJ&pg=6677%2C594998, accessed March 23, 2016; Jeff Rusinow, The Rise and Stall of Kohl’s Department Stores (s.l: ETR Group, 2008), 54-57. ^ Anthony Giorgianni, “Fake Sales Can Cost You,” Consumer Reports News, June 22, 2013; Rusinow, The Rise and Stall of Kohl’s Department Stores, 173. ^ Rusinow, The Rise and Stall of Kohl’s Department Stores, 38. Rusinow, Jeff. The Rise and Stall of Kohl’s Department Stores. s.l: ETR Group, 2008.